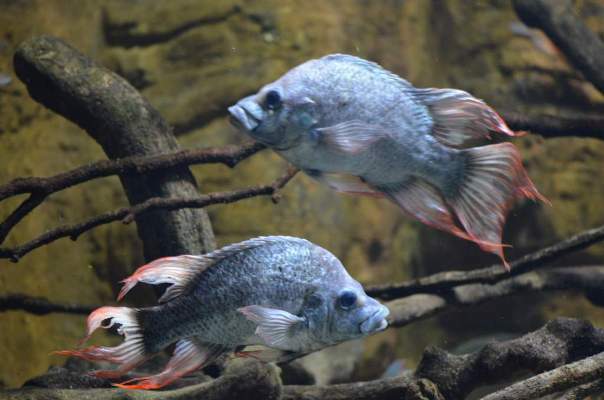 The Zoological Society of London (ZSL) is desperately seeking a female specimen or specimens of the Malagasy cichlid Ptychochromis insolitus to pair with the last two remaining males being maintained at London Zoo Aquarium. The species was described by Stiassny and Sparks in 2006 and was previously known by the names Ptychochromis sp. ‘Mangarahara’, P. sp. ‘Mandritsara’, and P. sp. ‘Sofia’ as well as being misidentified as the congener P. oligacanthus in the more-distant past. 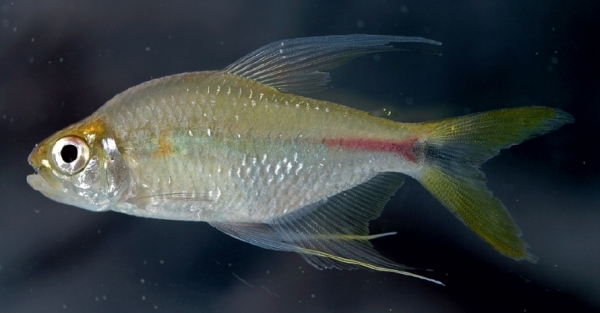 P. insolitus is endemic to the Sofia river drainage in northeastern Madagascar where it’s only been collected from the Mangarahara and Amboaboa tributary systems near the town of Mandritsari. The specific name insolitus is a Latin word meaning ‘unusual, odd, queer’ and was chosen in reference to this species’ somewhat unconventional appearance compared with other members of its genus from which it differs in possessing a reduced number of precaudal vertebrae (12 vs. 13–14 in congeners), a reduced number of infraorbital elements (five vs. six or seven in congeners), presence of a faint midlateral stripe, beginning just posterior to the dorsocaudal margin of the opercle and extending to the caudal-fin origin. 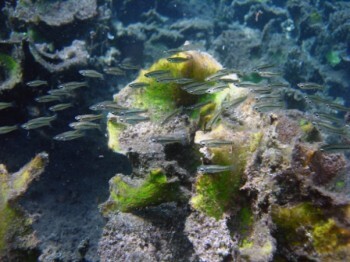 It also possesses strongly ctenoid scales, a character shared only with P. inornatus. Unfortunately much of the species’ natural habitat has undergone extensive degradation via deforestation, dam construction, introduced exotic species and fishing with water levels drastically low, and wild populations may already have disappeared. The Curator of the Aquarium at ZSL London Zoo, Brian Zimmerman, along with colleagues at Zurich Zoo in Switzerland has been trying to find other specimens in zoos around the world using international zoo and aquarium associations to reach as many experts and aquarists as possible, but so far they’ve had no luck finding females. The team are now launching a desperate appeal for private aquarium owners, fish collectors and hobbyists to come forward if they have or know of any females in existence, so that a vital conservation breeding programme can be started for the species. 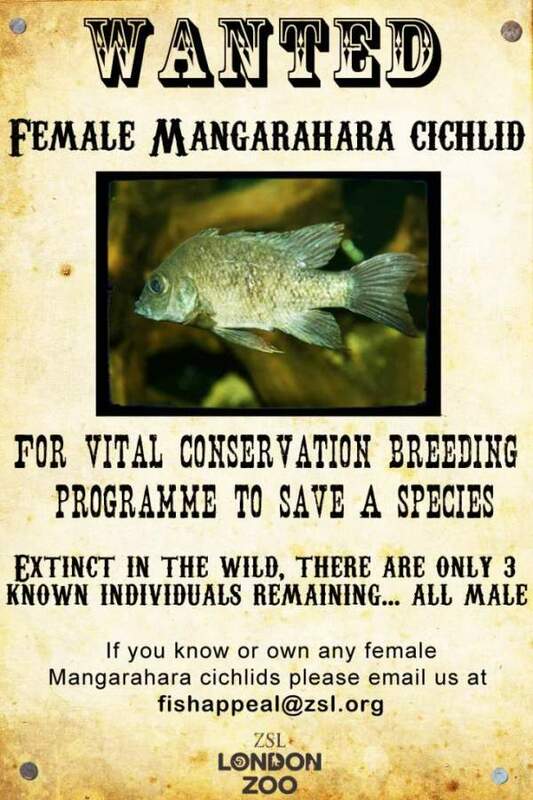 Mr. Zimmermann said: “The Mangarahara cichlid is shockingly and devastatingly facing extinction; its wild habitat no longer exists and as far as we can tell, only three males remain of this entire species.